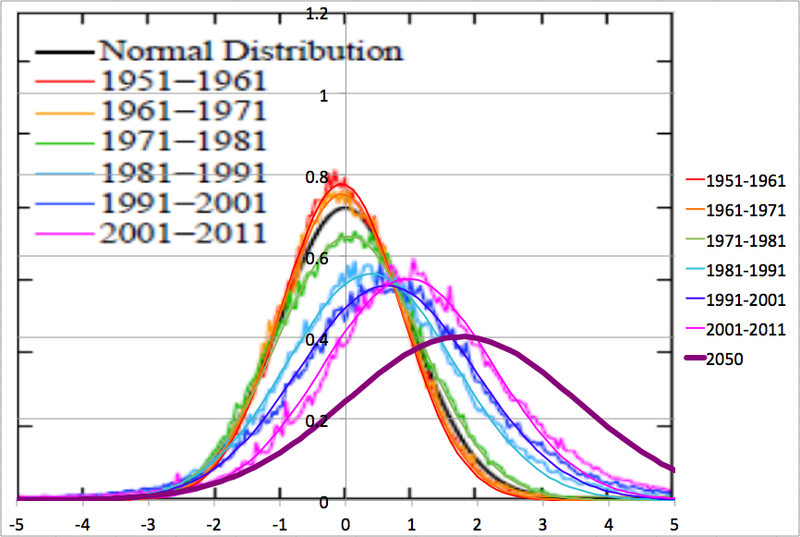 Early Warning: Slowing Rossby Waves Leading to Extreme Weather? I wanted to draw attention to a new climate science paper Evidence linking Arctic amplification to extreme weather in mid-latitudes by Francis and Vavrus. The paper is behind a paywall, alas, but I will try to summarize the main idea here, since I think this line of research is potentially very important if it turns out to be correct. 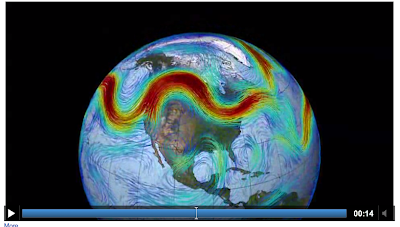 This picture shows a stylized cross-section of the circulation in the troposphere (the lower portion of earth's atmosphere in which temperature decreases with height and the atmosphere is well mixed). At the equator, it's hot and so the air rises, and as it does so it cools, which lowers the amount of water it can hold below the amount that is actually in it, causing rain, thunderstorms, etc. The resulting drier air eventually returns to the earth's surface around 30o north and south of the equator - this is the Hadley cell and the dry descending air is the cause of deserts at around those latitudes. Similarly at the poles it is very cold, causing sinking air, and driving a similar polar cell which requires air to be lifted up at around 60o north and south of the equator. In between there is a (somewhat amorphous and loosely structured) Ferrell cell which moves air northward at the surface and southward high up. All three of these cells essentially serve to move heat from the equator (where the sun shines the most) to the poles (where it shines the least). High up at the boundaries of the cells, air of quite different origins with large pressure and temperature differences meets. These differences drive strong winds, which you'd think would flow in a north south direction, but instead the rotation of the earth (Coriolis force) bends them around so that you end up with very rapid zonal (latitudinal) winds - the jet streams - occurring at high altitude. Note that the diagram above shows the atmosphere sloping down to the left. This is because the warmer atmosphere at the equator is expanded (at lower density) relative to the cold air at the poles. These height gradients can be thought of as equivalent to the temperature differences that drive the whole atmospheric circulation. If you click on my screenshot above you'll get the Wiki video in a separate window and I highly recommend going through it a couple of times. You'll notice that the jet streams have big chaotic-looking meanders in - the one in the screenshot above is about the size of North America, and that the meanders progress in a generally westward direction. These are called Rossby waves (also known as planetary waves). These things have a massive effect on the weather. If you think of the jet stream as being at the boundary of the polar cell and the Ferrel cell, it should be clear that when a big loop is south over your location, it's likely to be cold, whereas when you are in a northward tongue with the jet stream well north of you, it's going to be warmer. Similarly, since it's the mid latitudes where the regular pattern of cyclonic storms dominate the weather, the Rossby waves have a lot to do with where the storm tracks go and thus where it's wet and where it's dry. As the Rossby waves are slow - often taking a week to cross the US - they have a lot to do with the persistence of the weather - the fact that things are often nice for a few days or a week, and then wet and miserable for a few days at a time. 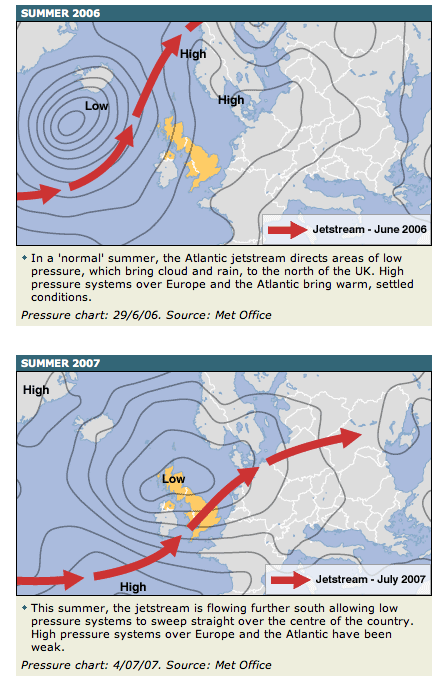 Indeed, anomalies in the jet streams can cause much longer patterns - sometimes a meander will become detached from the main course of the jet stream and just kind of hang around (one kind of what is referred to as atmospheric blocking) leading to weather that may not change for weeks or longer. So if the jet stream gets stuck - the Rossby waves stop or slow down - it can lead to weather extremes - one place may have flooding as rain continues for weeks or months, while another place may have drought as it stays sunny and dry there for an extended period. Here the red regions shows a thicker atmosphere than historically present (and the white asterisks represent statistically significant changes). The upper left figure is for OND=October, November, and December where the atmosphere is much warmer and extends quite a bit higher than it used to. 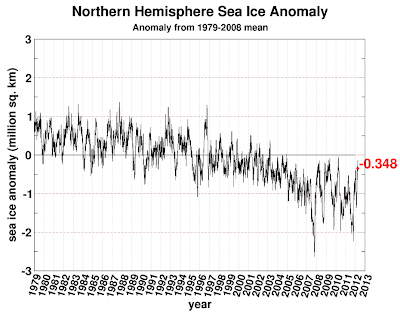 The anomalies persist into January, February, and March (especially over the north Atlantic) and then are smaller (but still present) in spring and early summer. Here the y-axis is average latitude of the northern tip of the waves. The paper is not slam-dunk proof. 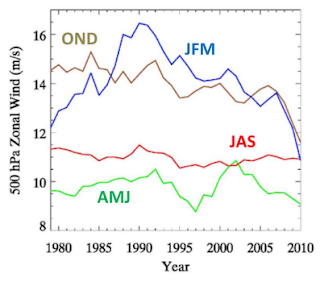 For example, note that zonal winds in Jan-Mar were increasing quite markedly through the 1980s, which doesn't fit the story and suggests there could be other things going on. 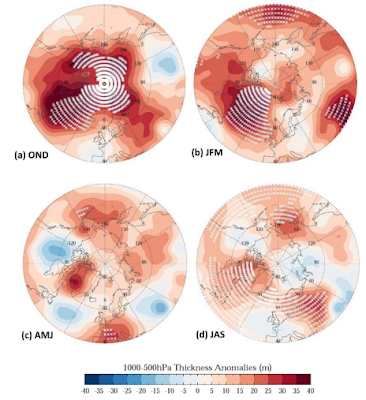 Also, the paper is based on reanalysis data - that means data that is pulled from running a meteorological weather forecasting model back over historical observations and then extracting data of interest from the model. Some aspects of the model may not be well constrained by observations - and in particular, it's not clear how well things like the northern edge of jet stream loops will be constrained by data. If the weather is becoming slower changing, we would expect that to increase the likelihood of both unusually cool damp summers, and that of long hot summers, relative to whatever the current average is. And this applies even more forcefully to winters, when the Arctic amplification of global warming is most pronounced. This would make sense of the extraordinarily mild winter in much of the US this year, following on a particularly harsh winter the previous year. So I think this is definitely something to follow. It's also worth making this point: if this turns out to be right, it will be the latest in a series of climate developments which were not well anticipated by climate science. 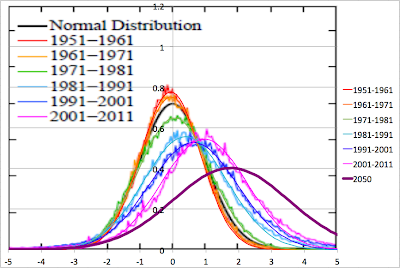 For example in the relevant section of the IPCC AR4 (from 2007) there is no discussion of the possibility that Rossby waves might slow down and cause more weather extremes. This will be like the largely unanticipated early collapse in Arctic sea ice, or the discovery that the Greenland and Antarctic ice sheets were degrading at the edges much faster than expected, and through an unanticipated mechanism (basal lubrication). In general, it appears to me that the climate system is more complex than climate science is currently able to fully model, and so it's constantly throwing up surprises in the way it reacts to the changes humanity is making in the atmosphere. This should not be reassuring. I know your paper said Northern Hemisphere, but was anything mentioned about the southern hemisphere? Looking at the globe, there is much more water, as opposed to land in the area bordering the southern polar region. I would imagine the same effect exists but it would be much more muted due to all that water. There is pretty much no appreciable land at 60 south. 30 south has little compared to the northern hemisphere. The 30 south line is a little below the midpoint of Australia, and that continent has had some very unusual weather the past few years. Incidentally there was terrible flooding in Columbia recently, and they are pretty close to the equator. They didn't assess it but I would expect the effect to be much smaller because Antarctica hasn't warmed nearly as much (there's a giant block of ice miles thick down there versus a few meters depth of sea ice to melt). Thanks for the summation. Enjoyed it thoroughly. As a practical matter, trading ag commodities should be very interesting to say the least. I understand that the atmospheric Rossby waves and the Gulf Stream contribute about equally to the habitability of northern Europe, which is situated at the same latitude as northern Canada. Oslo and mid Hudson Bay are both at 60° north. Changes in transport of atmospheric heat with the waves as you indicate might have an important influence on Europe also, possibly even more than on US. "In general, it appears to me that the climate system is more complex than climate science is currently able to fully model, and so it's constantly throwing up surprises in the way it reacts to the changes humanity is making in the atmosphere. This should not be reassuring." But this should not be come as a surprise. Why in the world would anyone assume that the global climate system is NOT more complex than our best attempts at modelling/understanding? It seems to me that Earth's climate system is so complex that we should EXPECT so-called "Black Swans" - not be surprised by them. Fascinating, like the synopsis – perhaps you could comment on this. 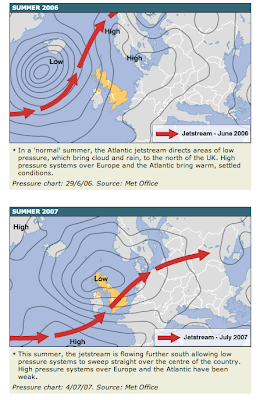 I live in the UK and for the past 3 years we have had awful summers cold and wet (and 2012 looks as though it’s going to be the same), the Jet Stream is south us whereas, at this time of the year, the JS should be moving north. I have been trying to work out the reason for this – it must be climate change related but the facts seem to contradict this behaviour. You mention that the warming of the Polar air mass has “slowed” the Rossby waves down but can this also affect the other characteristics? For example, the track, the wave length and amplitude. If so, this may be what I’m looking for. UK is explained mostly by this theory. There is a huge Rossby Wave loop over northern Europe for the third year in a row. It has blocked in the wrong place for more or less 4 months now and is predicted to be the same into August. We are on course to lose our butterfly population and other insects!! Lack of warmth, endless thick cloud cover and monsoon like rains means they cannot be sustained much longer. 20% fall in numbers every year for the last three years. It is increasingly difficult to grow crops, rotting due to waterlogged ground and no warmth to ripen them. Tomatoes are effectively impossible to be grown now. This year, bees were not present in our very cold April and first three weeks of May to pollinate apples trees etc. Major flood events occur every few years. Dozens of people have died and the ground is fully saturated in midsummer. April and June were both the wettest EVER recorded - July is following suite.